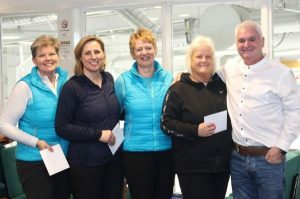 Quite a number of Orwell Ladies play in the Ladies Super League at Kinross Curling. The last session of the season on 3 April was particularly exciting as three different teams had the potential to win. After all the matches had been played, teams Glennie and Inglis were equal on points, so it went down to ends, with team Glennie winning the league by one end! Congratulations to Liz Glennie, Maggie Scott, Liz Thomson, Eileen Thomas and Jane Drysdale (all Orwell Ladies except Liz Thomson). Congratulations also to the runners up: Valerie Inglis, Susan Scougal, Heather Gough, Sue Cameron and Christine Taylor (all Orwell Ladies except Heather Gough). Thanks to Coady’s Bar, Dunfermline, who sponsor the Ladies Super League.